Everyday we have some new information about the much-awaited flagship from Apple, in the form of leaks or patent. In a wave of Apple patents published by the US Patent and Trademark Office Tuesday, and spotted by Patently Apple, two could potentially relate to the iPhone 8, which is expected later this year. The first is with an edge-to-edge display and describes how a flat screen can wrap around the edge of a device to maximize the areas devoted to display and touch sensitivity. It jibes with numerous rumors that point to the iPhone 8 having a wraparound, OLED-based display, such as a Bloomberg report in April. The second relates to embedding Apple's biometric fingerprint reader technology, Touch ID, behind the display itself rather than inside the Home button, where it is now. It bolsters previous reports about Apple having issues with the new placement. Other than this from the past, we have below information about iPhone 8. After three consecutive years with nearly identical designs, iPhone lovers will undoubtedly breathe a sigh of relief in 2017. According to about a dozen independent reports, the iPhone 8 will feature a top-to-bottom design overhaul. Rumors from just about every reputable source on the planet have now piled onto noted Apple insider Ming-Chi Kuo’s original report stating that the new iPhone 8 will feature a big redesign. After moving to an aluminum housing back in 2014, Apple will supposedly switch back to a glass sandwich design with this year’s iPhone 8. The front and back of the phone are expected to be constructed of sturdy glass, while the edges of the handset will be stainless steel. Several reports also state that the edge-to-edge display on the iPhone 8 will curve down at the sides, but we expect it to be a subtle curve like the concept render at the top of this post, as opposed to a big slope like what we’ve seen on Samsung smartphones. Also of note, the home button is dead — long live the virtual home button. Multiple solid reports have stated that Apple’s iPhone 8 will not include a physical home button like every iPhone before it. Instead, the display will occupy a much larger portion of the phone’s face, and the home button’s various functions will be replaced with 3D Touch gestures. As for the Touch ID fingerprint scanner, don’t expect Apple to move it to the back of the phone like other smartphone makers have. 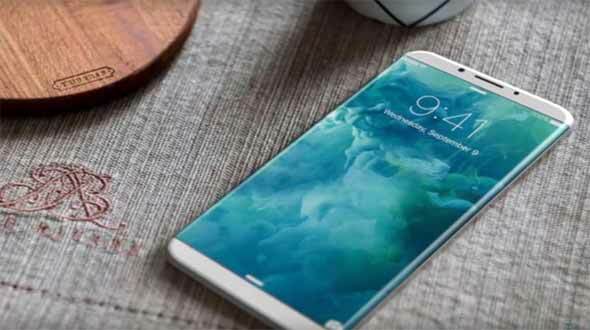 Instead, the iPhone 8 will feature a much better and more sophisticated design, incorporating the fingerprint scanner into the display itself. Speaking if the iPhone 8’s display, 2017 will mark the first year Apple will shift from an LCD panel to an OLED panel in the iPhone. Like Samsung’s class-leading Galaxy phones, Apple’s iPhone 8 will feature an OLED panel. Also like Samsung’s recent Galaxy phones, the iPhone 8 display is expected to be a flexible panel that curves on either side at the edges. As we noted above, however, we expect the curve to be much more subtle — just a slight downward bend for styling. It goes without saying that the iPhone 8 will be Apple’s most powerful smartphone ever. Every new iPhone is the most powerful iPhone ever. In 2017, however, Apple’s new 10-nanometer A11 Fusion chipset should provide a huge performance bump while also offering much better efficiency where battery consumption is concerned.